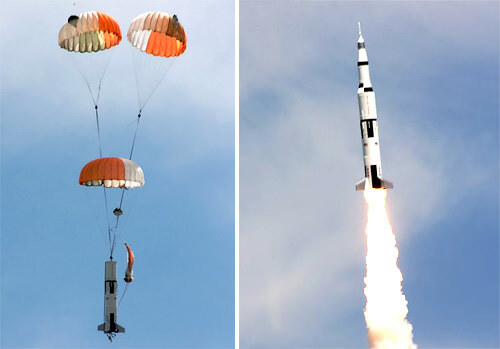 A world record model rocket launch attempt on Saturday lifted off — and landed — successfully. Steve Eves worked for two years building the rocket, a 36-foot (10.9-meter) tall, 1:10 scale Saturn V model rocket. Eves now holds the world record for the largest amateur rocket to ever be launched. The picture-perfect launch took place on a farmer’s field near Price, Maryland, about 50 miles (80 km) east of Baltimore, delighting those in attendance. The main body of the rocket even landed upright. See the video below. Here’s a link to a video of Steve Eves talking about his rocket before the launch. Thanks to Keith Stein of the DC Space News Examiner for passing the word on to us. wow , :p maybe he could send the curriculum at Nasa or SpaceX , or Esa ..
Well, the question is, of course, why is this record-setting? For the size of the thing? For the height it reached? Why? Its one of the biggest flying scale models I’ve ever seen. I know that other rockets have reached greater altitude and a few may have had similar size… but they weren’t exactly models of anything. Nobody remembers the article from 3 days ago saying this would be the world record attempt for the largest amateur rocket to ever be launched? That fact has now been added to the article above. Thats Was Awsome..someone build a Space shuttle one now!!.. Love it. Now for a bit more carbon fibre, some bigger engines, a guidance system ….. If they did the separation and ignited the second stage when the first burned out I would have really been impressed. Previous PostPrevious Did Dark Matter Annihilate Our Early Universe?